Oh I love a flask. Mainly I love what's generally inside the flask, but that's another topic. Now you can make your own custom adult beverage transport device! Below are a few of my newest designs in the shop and by clicking the "customize" button you can make your very own. Change the fonts, upload your own graphics or photos and make a one-of-a-kind flask. These make great personalized gifts. 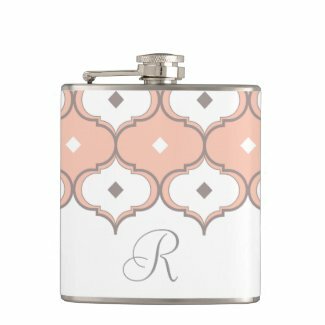 Monogram floral flask with customizable monogram and date. Perfect for bridesmaids to commemorate your wedding date or bachelorette party.